As President Obama visited Flint, Mich., Wednesday, the White House defended the sometimes-criticized federal response to the water crisis that has involved nearly a dozen federal agencies. Republicans in Congress have blamed the Environmental Protection Agency for its failure to adequately warn Flint residents of unsafe levels of contaminants in the city’s drinking water, though the agency has largely deflected responsibility. Federal officials have primarily pointed to decisions made at the state and local level to switch the city’s water source as the cause of the crisis. Congress continues to debate an aid package for the city to replace its lead-tainted pipes, but federal agencies have already sprung into action. White House Press Secretary Josh Earnest highlighted the role federal employees have played in responding to the situation at a briefing this week, again avoiding culpability at the federal level. 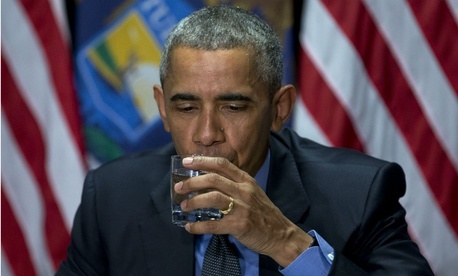 Obama initiated a “whole-of-government” response after declaring a state of emergency in January to address the contaminated water. The Health and Human Services Department has coordinated the federal response, with Assistant Secretary for Preparedness and Response Nicole Lurie leading the efforts. HHS has awarded $500,000 to Flint health centers and expanded Medicaid coverage and services to Flint residents impacted by lead exposure. About 45,000 individuals are now eligible for coverage or will see expanded access to services. The department deployed assistant U.S. surgeon general Rear Adm. Michelle Dunwoody to serve as a “temporary senior advisor” to Flint’s mayor. It has also expanded and enhanced Head Start and Early Head Start services to children in the city. The Federal Emergency Management Agency has led the charge to distribute water in Flint, providing 9.3 million liters in addition to filters and replacement cartridges. The Housing and Urban Development Department is in the process of ensuring every unit of public and HUD-supported housing has water filters installed. HUD is also working with a local provider to offer testing of lead levels in the blood of children in public housing. The Agriculture Department temporarily authorized the testing at Special Supplemental Nutrition Program for Women, Infants and Children clinics, while HHS and the U.S. Public Health Service Commissioned Corps have attempted to boost access to the examinations for the general Flint population. USDA has also increased education efforts on dietary changes that can offset lead absorption and provided more funds for healthy school lunches that “may help” mitigate lead levels in the body. The department authorized vendors of the Flint Farmers Market to accept food stamps and extended a pilot program for eligible families with school children to receive a small food stipend over the summer. The Food Safety and Inspection Service has already cleared three of the four establishments it regulates in Flint of any lead contamination. While the EPA has taken heat for its failures to sound the alarms in Flint, and some officials have been forced out of the agency, it has worked on the ground in the area to test lead levels in the water. It has tested more than 4,500 samples in 650 homes that have requested an evaluation, and continues to do so for those who ask. It has also tested water “throughout the city” (with publicly available interactive maps showcasing results), assessed the effectiveness of water filters (which the agency has said are working) and overseen the Michigan government’s testing. EPA established a task force comprised of officials in the area to assist state and local leaders and coordinate their response with the federal effort. EPA is also working with the Centers for Disease Control and Prevention to investigate skin rashes of Flint residents. CDC nurses have worked with other HHS workers to make home visits and phone calls to enroll children in Michigan’s state case management program. HHS is also coordinating with community psychological care providers to assist Flint residents in need. The Labor Department set aside $15 million in grant money to provide Flint residents with temporary recovery work and career services. The Small Business Administration has made a series of $100,000 grants available to companies in the area. On Wednesday, Obama sat with Lurie, HHS Secretary Sylvia Burwell, EPA Administrator Gina McCarthy and other federal and local officials in Flint. He took a drink of the city’s filtered water, saying it was safe for children above the age of six to do the same. He said he met with federal employees contributing to the response and thanked them for their “all-hands-on-deck” efforts.